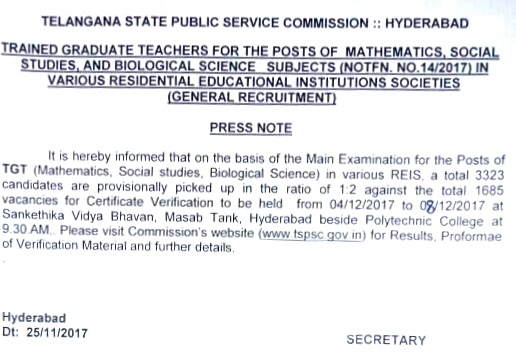 TSPSC Released Provisional Selection List of TGT Mathematics, Social Studies & Biological Sciences For Certificate Verification.it will be held from 04-12-2017 to 08-12-2017. 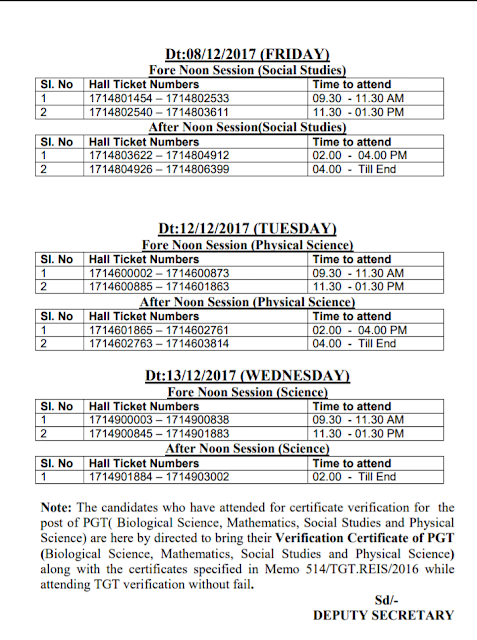 Provisional List of eligible candidates picked up for Certificate Verification for the Post of TGT (Mathematics, Social Studies & Biological Sciences) in various Residential Educational Institutions Societies vide Notification No. 14/2017. Provisional List of eligible candidates picked up for Certificate Verification for the Post of TGT (Mathematics, Social Studies &Biological Sciences) in various Residential Educational Institutions Societies vide Notification No. 14/2017. 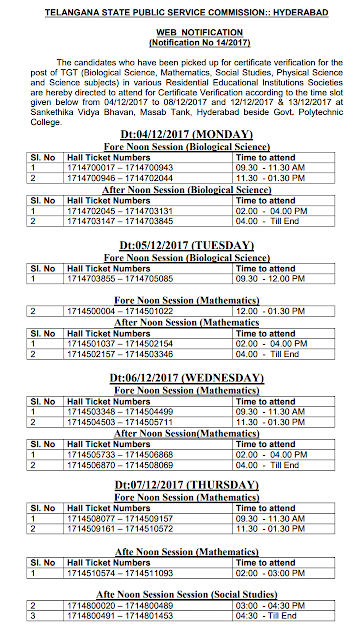 It is hereby notified that on the basis of Main Examination for the Post of TGT (Mathematics, Social Studies &Biological Sciences) in various Residential Educational Institutions Societies, 3323 candidates with the following Hall Ticket Numbers are provisionally picked up in the ratio of 1:2 for Certificate Verification against total number of 1685 vacancies. 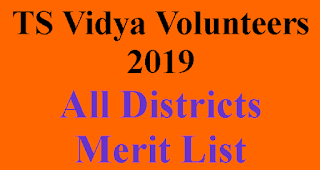 The Certificate Verification is scheduled to be held from 04/12/2017 to 08/12/2017 at Sankethika Vidya Bhavan, Masab Tank, Hyderabad beside Govt., Polytechnic College from 9.30 AM onwards... 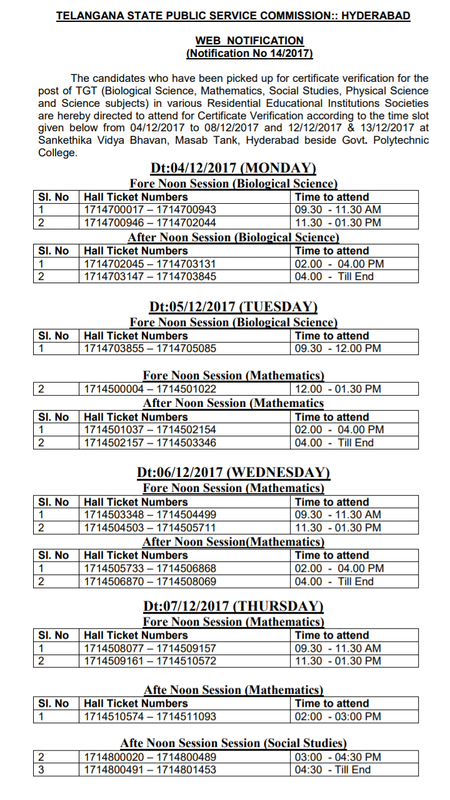 The candidates who are called for Verification of Certificates have to produce the following certificates in original along with a set of Photostat copies duly attested by Gazzeted Officer at the time of Verification of Certificates, failing which, they will NOT be admitted in subsequent process of selection . No request will be entertained for subsequent submission of any of the required certificates. In terms of the Notification, the candidate should possess the requisite qualifications as on the date of the Notification. The Commission reserves right to disqualify any candidate, if he/she is not found eligible for any reason at any stage. Admission to Verification of Certificates does not confer ipso facto any right for Final selection. 10. Disability Certificate (SADAREM Certificate) in case of PH candidates. 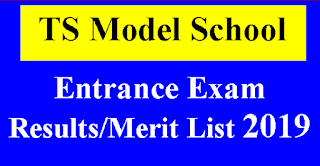 The PH candidates have to under go a medical examination at respective Medical Board. 16. 2 sets of Attestation forms duly signed by Gazzetted Officer. Please visit the Commission’s website www.tspsc.gov.in for the Verification Material and further details. Attestation Form. Check List Form. Memo Form.